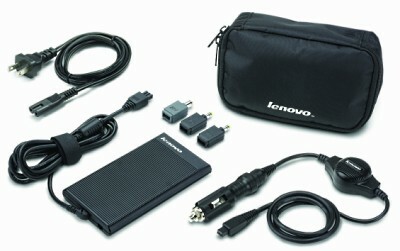 In 3-4 weeks, Lenovo is set to start shipping a new, much slimmer, AC/DC adapter for its laptops. It will charge Lenovo’s laptops (such as the ThinkPad X61, 3000 V200 Series, the IdeaPad and probably the ThinkPad X300). In addition, it will charge cell phones, portable music devices, and PDAs through the use of an optional adapter kit with interchangeable tips (which also includes a car charger). It can even charge two devices at the same time. It’s priced at $119 and the model # is 41n8460. Lenovo today announced its new ThinkPad and IdeaPad 90W slim AC/DC combo adapter, the company’s first all-in-one adapter designed to charge other electronic devices such as most cell phones and PDAs; and many mobile music devices (using optional connector tips.) At about a half-inch thick and 33 percent smaller than Lenovo’s previous combo adapter, it’s roughly the size of a deck of playing cards â€“ small enough to easily fit into a shirt pocket…..
Also available is an optional dual-charging cable allowing more than one device to be charged at the same time and optional power tips which enable users to customize the adapter to whatever devices need to be charged. This entry was posted in Accessories, Announcements, IBM/Lenovo. Bookmark the permalink.